School was out at the University of Miami. I was at the salon down the street and I decided to get my nails done in orange--bright, electric, and hot--just like South Florida. What the heck. Whose gonna see how bright they are. It's summer. Just then, my phone dinged and I looked to see an email from the U.S. Department of State Protocol. Hillary Clinton was inviting me to lunch. I thought it was spam. And I almost deleted it. But then I took a closer look. And no, it was not spam. President Benigno Aquino was going to be in DC on June 8, 2012 and then-Secretary of State, Hillary Clinton was having a lunch for him. It would be the first of two special visits to Washington DC that summer. 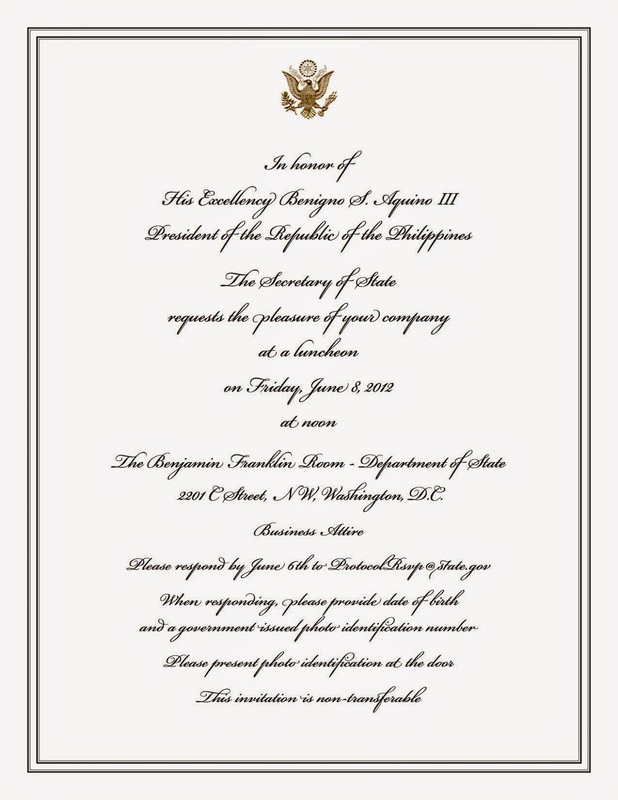 The first would be this lunch at the State Department and later that month, on June 21st., I would be among the 100 invited to a White House Briefing for Filipino Americans. When we arrived there was a string orchestra playing and a red carpet. The late Senator Daniel Inouye welcomed us into the room. And when a writer friend of mine realized we were not going to have an audience with Secretary Clinton, she came to my table and suggested we introduce ourselves to her. We waited until dessert. I noticed that while the rest of us had pretty chocolate custards with fancy cookies, Hillary was having a fruit cup. We stood in line and had to introduce ourselves first to President Benigno Aquino. Formalities. It was Hillary we wanted to meet. I wanted to tell her so many things. I wanted to tell her about the Lolas of LILA--Filipina Comfort Women of World War II. I thought I'd get it all in there in that moment. But all I said was, "You're good friends with my boss." "Who's your boss?" she asked me. "Oh, I love her!" Secretary Clinton said. And then my time was up. I would not get to say a word of substance. And so I wrote her a note and sent her this photo of the Lolas. After all, writing is what I do best. They work like guardian angels -- they follow me and guide me like a river of hands -- they whisper stories and prayers and words of advice. Today I imagine they follow me into the dining hall -- not just the Pinay but all of them -- all 200,000 of them -- the living and the dead -- their light spirits of brown and yellow skin -- floating right behind me, attending to each guest, whispering in each ear, hovering like grannies who have just cooked each of us a meal. A little love, a little justice. A little integrity. And when the meal is over, they will follow me out the door and right down the street. My angels of justice. And I will do the same for them, until their stories are told. Until justice prevails.